BacATak is a full spectrum antibacterial that helps the body to combat bacterial infections. Symptoms of bacterial toxicity can include: gas, bloating, diarrhea or constipation, chronic sinus congestion, asthma, allergies, fatigue, headaches, and muscle and joint pain. 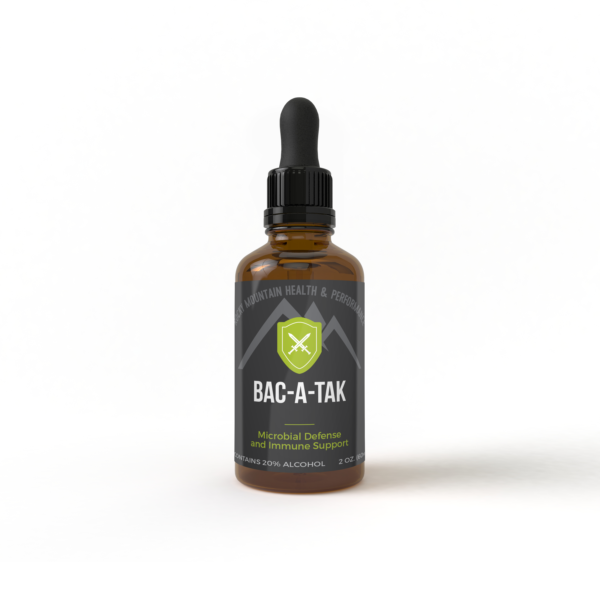 BacATak is a full spectrum antibacterial that helps the body to combat bacterial infections. Symptoms of bacterial toxicity can include: gas, bloating, diarrhea or constipation, chronic sinus congestion, asthma, allergies, fatigue, headaches, and muscle and joint pain. BacATak is to be used in conjunction with Armor Detox or other liver or kidney support while adhering to a strict Anti-Bacterial diet plan. BacATak is safe and effective for all ages. Recommended dosage: 1mL 3 times per day for active detoxification.